From Software has released another Dark Souls II trailer to the public, revealing more enemies, magic abilities, weapons and armor. The trailer also gave us a confirmation that Dark Souls II is going to get a Collector’s Edition and a Black Armor Edition. In the trailer, we get to hear Nadine Shah’s “Aching Bones” playing in the background as our main character fights through hordes of enemies. We see some new magic abilities that look like the Fire Orb’s pyromancy, the Crystal Magic Weapon sorcery spell, and the miracle Great Lighting Spear. We also get to see some new weapons and armor, including a glimpse at the dual-wielding fighting style. The trailer also shows us the that Dark Souls II will continue the tradition of challenging players, as it includes new dangerous enemies like large stone-like knights and wizards that unleashes waves of black magic. Those who pre-order Dark Souls II will be able to get their hands on the Black Armor Edition. This edition will come with a free collectible metal case containing the game and the original soundtrack. This collectible case will have a unique Warrior Knight box art. The original soundtrack will be composed by Motoi Sakuraba, who also composed for the original Dark Souls title. Those who are ready to get the Dark Souls II Collector’s Edition will find it containing a “premium quality 12 inch tall Warrior Knight figurine, made from solid PVC weighing nearly 16 full ounces packed inside a custom printed display box with transparent window”. The Collector’s Edition will also come with “an exclusive hardbound artbook filled with never-seen-before images from the game developer, as well as a sizable full-color microfiber game map”. It will also come with the Black Armor Edition items. Look below to see the trailer yourself. 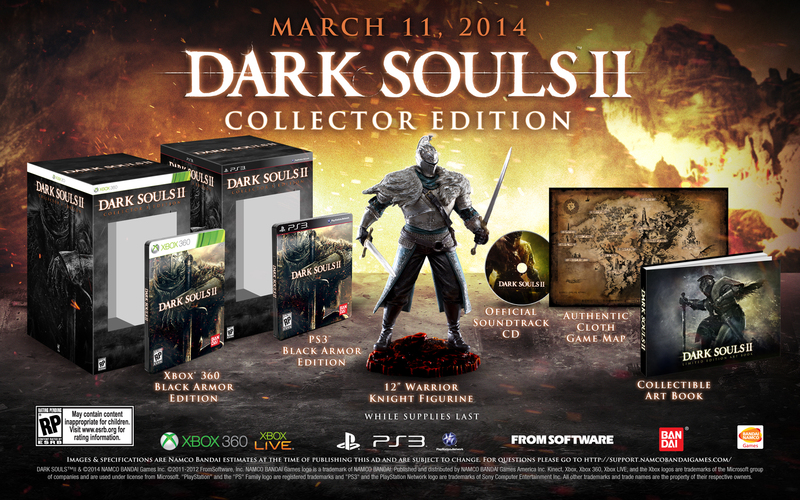 The Black Armor Edition and the Collector’s Edition of Dark Souls II will be in limited supply. Those who are interested in pre-ordering either, can go to Amazon or Gamestop. Visit the game’s official website. Dark Souls II is going to be released on the PS3, Xbox 360, and the PC on March 11, 2014 in North America and Europe. Next Post:(Japan) Two Sequels for Bravely Default?